Tropical Banana Rum and Melon Breakfast Bowls. What makes mornings better, besides a juicy melon full of delicious fruit and coconut shards and toasted almonds? A juicy melon full of delicious fruit and coconut shards and toasted almonds and rum. I added a little drip drop of rum to this smoothie in a cantaloupe. P.S. I can’t be held responsible for one consuming this before work. I mean, I just don’t know. Part me feels like you may exhibit some of the same behavior that I witnessed on bachelor in paradise last night, but ummmm. Who knows. The deal is that I’ve totally been holding out on you. I’ve been making and eating these bowls all summer (you probably saw this one on snapchat back in June) yet I haven’t said word about them besides some measly instagram. Why why why? Acai bowls are usually my cold smoothie of choice for breakfast, especially if it’s freezing and thick enough to eat with a spoon. But after my last acai bowl caused my blender to explode a few weeks ago and then I spent forever cleaning confetti dots off the ceiling, I’ve sort of been on the old-school, I’m-stuck-in-2009 banana ice cream trend. Oooooh it’s oh-so good. Back in the day I used to cover some banana blender ice cream with a few chocolate chips and melty peanut butter and coconut butter and even sprinkles and man, it’s freaking good. As long as you like bananas. Remember that?! These days, I always demand that we keep a bag of frozen bananas in the fridge because in my opinion – they make most smoothies take on the texture of ice cream and who doesn’t adore that in a drink. It’s like a big ol’ milkshake, but with fruit. So, health food. And when I say “demand,” I mean that I slice the bananas and freeze them myself every month. Thumbs up. The key here is to find a ripe melon that can be scooped out WITH the frozen smoothie and eaten. It has so many delicious flavors: banana, mango, melon, coconut milk – tons of my favorite thangs that scream summer and are whimpering that we only have a few weeks of the season left. They are begging you to consume them. You can also do this with baby watermelon if you’re not weird about seeds. I sort of think that berry flavors go best with the watermelon, so I’d throw a bunch of frozen strawberries and cherries in the blender and go from there. And it’s not like you NEED to add the rum, but I mean it is summer and all. So maybe just add the rum until mid-September. Then we can add wine. !!!!!!!!!! 2 tablespoons hemp seeds, or chia seeds! Add the bananas, mango, greek yogurt and coconut milk to a high-powered blender or food processor. Blend until thick and creamy and the frozen chunks are all pureed, sort of resembling a soft serve ice cream. Add in the vanilla bean pasta and rum and blend again until just combined. Equally split the smoothies between the cantaloupe bowls. Top each with 1/3 cup blueberries, 2 tablespoons toasted almonds, 2 tablespoons coconut and 1 tablespoon hemp seeds. Add anything else you may love! I recommend eating it with a grapefruit spoon and going for chunks of the cantaloupe first so the smoothie can sink further down into the ‘bowl” as opposed to over the edges. YES. Jessica this is the best! I need this delicious dreamy bowl packed with all sorts of goodness like right now in my mouth!! Ho Ho Ho and a bottle of rum. These look really good. My SIster in law in getting married in a couple of weeks, I should send her this link for the morning breakfast the day after the wedding. People would swoon! She’s getting married over Lake Ontario but there’s no restaurants or grocery stores out that way. Completely isolated. And I like the coconut shards, which is rare for men. Take a poll. Most men hate coconut. But why? I like the way you think. Also, that cherry on top is perfect!!!! Banana Rum smoothie?!?! Yes! I’ll take this every morning, please! Well, this is just all sort of awesome. And yes to the rum. And Bachelor in Paradise – oh my gosh it’s my guilty pleasure. I definitely watched while eating a whole pint of ice cream last night. And excited to do it all over again tonight. Ha! Edible bowl? Rum in my banana soft serve? Do the snozzberries also taste like snozzberies? Is this the breakfast of my dreams? This looks delicious! We would probably pass on the rum, but yes to everything else! Yum! The melons this time of year from the farmers market are just so delicious. I just eat the whole think in one sitting. However this popped into your mind I must say that it’s genius!! so unique! I just had a dream about buying a huge bottle of Sailor Jerry’s…. rum for breakfast would be an amazing start to the day! Woah! These are craziness… in the best possible way! Love love love! Pinned! Love your blog :) Your recipes and tips are great, especially like the way how you describe every detail! and the pictures are lovely! This … is … heavenly! Love! Awesome ! I really appreciate the way you have made this. Thanks for sharing ! Laughed at “vanilla bean pasta” in the recipe. Not sure if this was intended or if it was a typo, but if the latter is the case, please don’t change it! 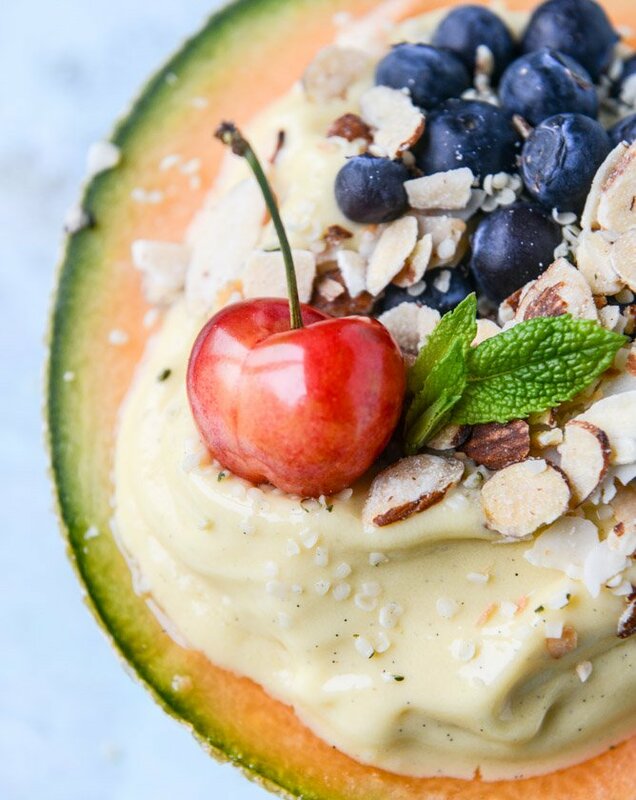 :) This looks amazing- normally I steer clear of the 1-ingredient banana ice cream recipes, but with coconut, mango and those gorgeous vanilla flecks this looks like a game changer for me! So much goodness in one edible bowl! I love this creation and I want it NOW! Pingback: These Frozen Fruit Recipes Will Make You Drool!